The new approach for testing and certification of ground improvement works using HEIC revolve around using conventional testing methods in conjunction with the CIR measurement system in order to be able to “verify” the ground improvement works over the entire site area. The preference in this approach is to use conventional testing methods that provide a direct measurement of the soil properties required for design purposes (strength and deformation) rather than a “proxy” such as soil density. The heart of the CIR measurement system is the Landpac Impactometer. This impactometer employs an accelerometer, which is fitted to the axle between the two masses of the impact compactor. 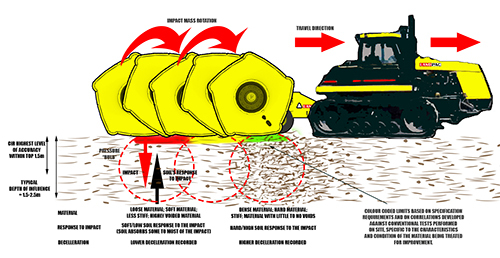 Deceleration is measured on a continuous basis during the operation of the impact compactor and the peak deceleration of the compaction masses is recorded at each impact. While the material being treated is still in a loose state, most of the initial compaction energy will lead to plastic deformation of the soil. At this stage, the soil has a soft response to the impact compaction loads applied and relatively low decelerations of the compaction masses are measured. Further compaction of the material results in an increased density and stiffness of the material and greater decelerations of the compaction masses are measured as the material moves towards the elastic state. The decelerations measured are in effect a direct measurement of the material’s response to the “dynamic load” imparted by the impact compaction masses with each impact blow. The impactometer thus measures a “dynamic stiffness” of the material being treated by HEIC. The CIR measurement system employs a GPS receiver to locate the position of the impact roller. Each of the peak decelerations measured using the Landpac Impactometer is recorded relative to its position on site as determined by an integrated GPS receiver. 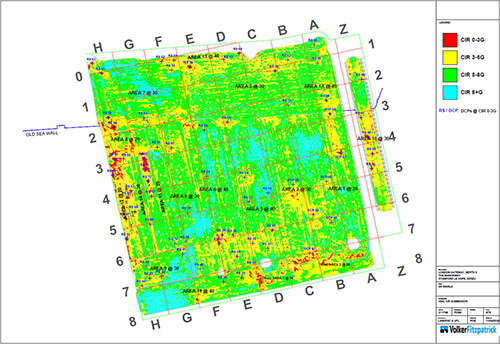 It is thus possible to produce an accurate “map” of the deceleration values over the entire site. In order to provide a meaningful measure of the ground improvement works performed using HEIC it is necessary to relate the decelerations that are measured by the CIR measurement system to an appropriate traditional engineering measurement suitable for the particular site. To do this, it is necessary to generate a direct correlation between the decelerations measured in the form of “g’s” and an “equivalent” conventional testing method result. During the performance of a trial on a representative section of the site, decelerations are recorded using the CIR measurement system and conventional testing, such as density, Cone Penetration Testing (CPT), Dynamic Cone Penetration (DCP), Plate Load Testing (PLT), Zone Load Testing (ZLT), or California Bearing Ratio (CBR), is conducted at specific points on the trial section. The decelerations that were measured and recorded by the CIR system at the specific points where the conventional tests were performed are then correlated back to the results of these conventionally measured engineering properties. With customer specification requirements on hand, it is possible to establish limits for the decelerations measured on site using the CIR measurement system. Green areas : these areas are likely to exceed engineering requirements of strength and stiffness and do not require any further conventional testing. 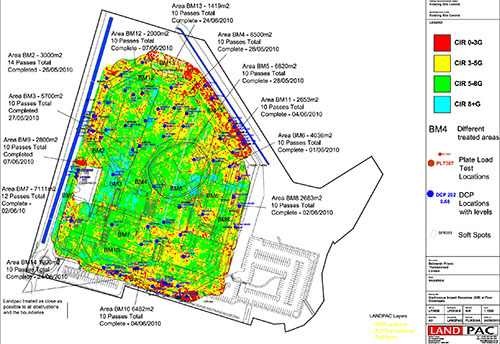 Yellow Areas : these areas could need some further investigation with conventional testing to verify their acceptance relative to the engineering requirements. 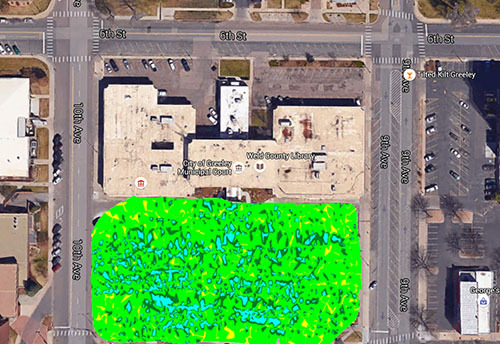 Red areas : these areas are likely to fall short of engineering requirements and would require specific investigation with conventional testing with a view to further ground improvement treatment or remediation if required. By using the CIR measurement system to identify the relative strength and stiffness of the material being treated, it is possible to focus the conventional tests in the relatively weaker areas. 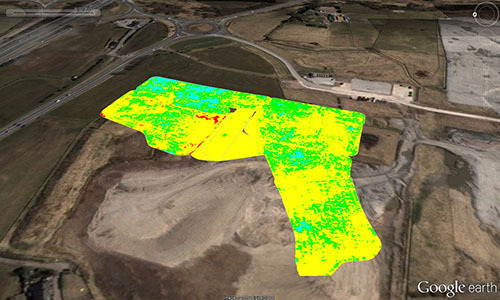 By ensuring that the relatively weaker areas conform to specification, it is then possible to use the CIR results to extrapolate the conventional test results over the entire site thereby increasing the certainty of the overall future performance of the compaction works. This process can actually allow for a reduced level of conventional testing thereby reducing the cost of testing whilst still increasing the level of certainty of the test programme. How often should you be verifying the correlations? Do you still need to perform conventional testing? What engineering properties can you correlate to? What is the best engineering property to use for correlation purposes? Is one correlation trial sufficient for an entire site? Can you use in-situ compaction correlations on thick layerworks compaction, both using an impact roller for compaction? Is CIR an absolute measurement? There is no fixed setting for this but it is well understood that as material conditions change, this may have an effect on the decelerations recorded. If it is known that the material condition has changed on site, it is advised to perform a few conventional tests to verify the accuracy of the correlations. Should the material be consistent, it remains advisable to verify the correlations from time to time. This is generally done when weaker areas need to be verified; the data collected can be used for correlation verification. CIR can be used to reduce the testing regime considerably but it is still advisable to perform conventional tests to verify the accuracy of the correlations. Conventional testing would still be required in sections that have been identified as not meeting specification by CIR. Generally, CIR results can be correlated to most engineering properties, including density, Cone Penetration Testing (CPT), Dynamic Cone Penetration (DCP), Plate Load Testing (PLT), Zone Load Testing (ZLT), and California Bearing Ratio (CBR). They’re all usable except that with some, additional tests may be required for a more accurate correlation. This is generally the case with density results. CPT results (measuring Qc values) and DCP results (measuring penetration rates and/or equivalent CBRs) are generally easily correlated. Provided that the material is of a similar nature over the entire site, then one correlation would suffice (this correlation can be verified using CIR measurements and conventional test results during the site operations phase). If however, there are areas on the site that have materials that differ significantly, then it is necessary to perform a correlation trial on a representative section for each material type. In such cases, it is important to ensure that the CIR results during compaction operations are processed using the correct correlation relative to the material type of the area being measured. No. Separate trials must be conducted in order to establish two series of limits for control purposes. No. A deceleration measurement in itself has no meaningful value to a civil or geotechnical engineer. That is why it needs to be correlated to an engineering property that is well understood. A result of 6 g’s doesn’t mean much, but if 6 g’s is equivalent to a CBR of 25% up to 2metres below the surface, then it is better understood.